Call them what you will – space blanket, mylar blanket, survival blanket, or emergency blanket. You should own at least one. Winters where I come from, are harsh. The Rocky Mountains are not gentile – especially if sheltering in snow and ice. Becoming trapped in freezing temperatures is a recipe for disaster. In Colorado, it’s a fairly standard practice to keep an emergency blanket inside of your glove box. It’s a smart survival insurance policy if you happen to get stuck overnight in frigid conditions. Imagine driving on a rural mountain road in the dead of night. All a sudden your car discovers some black ice. Your wheels lose traction, and you lose control. You helplessly slide sideways into a massive snowdrift. You hit the gas but your wheels just spin freely – you’re stuck. There’s little hope of traffic passing by at this late hour, so you quickly dial a tow truck company. You have no choice, you must take refuge from the freezing winter conditions. You huddle inside your vehicle and thankfully you’re our protected from the wind. But the freezing cold temps begin seeping in, little by little, hour by hour. But luckily, you’ve prepared for this. Instead of nearly freezing to death, you grab your emergency survival blanket from a winter survival kit you keep in your car. It’s small, it’s light, and takes up nearly no space and it will keep you warm tonight – possibly saving your life. Staying warm is a key factor in surviving such a perilous situation. Hypothermia is no joke. Exposure kills about 1300 people in the US every year. Sadly most those deaths could have been prevented with a survival blanket. The problem is there are a lot of options that claim to use super high-tech, fancy materials to keep you warm. Some of those claims are accurate, and others, well, less so. Trusting an emergency blanket that won’t keep you warm when you need it most, a terrible survival technique. You absolutely must make sure the survival blanket you buy works as advertised. Otherwise, you might be up an icy creek without a paddle. That’s precisely why we wrote this guide. It’s meant to cut through the static and false-advertising floating around out there. To give you a clear idea of what you need from a survival blanket and a few of the better ones on the market. Like anything as useful as emergency blankets, there are different materials used. Over the years, as survival technology has changed, so too have survival blankets. Some of these have stuck around through the years, and are still widely used today. Others have faded with the ages. Originally, survival blankets were animal pelts. Way back in the day, our ancestors used mammoth hides for their tents and blankets. But pelts (especially those of mammoths) are thick and heavy and bulky. While useful, they make for extremely heavy survival blankets. One of history’s favorite materials for survival blankets has been wool. Why wool? Compared to leather hides, wool is much lighter. It’s also very warm, insulates well to trap heat and it’s water resistant. Wool blankets are notoriously warm and are available in a variety of styles, sizes, and prices. Some come from boutiques and can get expensive. Others are cheap and easy to find at army surplus stores. But even wool is bulky compared to modern survival blankets, like polar fleece. Made from the synthetic material, polyester, polar fleece is extremely lightweight. It also compresses easily into a pack or a tight space. It’s easy to wash and stretches more than most other fabric materials. Down and synthetic down are my personal favorite sleeping bags for backpacking and wilderness adventures. They generate tons of heat and trap the majority of your body heat, keeping it from dissipating. Down is one of the warmest materials known to man, which is why the best modern sleeping bags use it. The advantage to synthetic down is that it can get wet and still keep you warm – while real down loses its heat-generating abilities as soon as it gets damp. These make excellent survival blankets. You can pack them into small stuff sacks for portable storage. But even down and polar fleece is bulky in comparison to space blanket technology. Originally designed by NASA, BoPET (Biaxially-oriented polyethylene terephthalate) is a hyper-light material that looks sort of like tin foil. It’s more commonly known as Mylar. Mylar blankets are a highly durable material that folds into the size of an un-popped package of popcorn. This stuff has saved countless lives in the backcountry and wilderness situations. In fact, many medical teams carry mylar space blankets in their first aid survival kits. It’s insanely light, it packs down into almost nothing, and it’s ideal for trapping body heat. 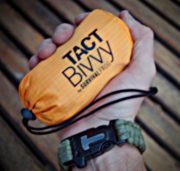 Advertised as “one of the most advanced survival tools on the planet,” the Tact Bivvy is an incredible piece of survival gear. Small enough to fit in your hand, this emergency sleeping bag utilizes Mylar. Mylar provides the highest quality, most effective survival blanket around. And because it’s taped together, it traps your body heat inside more like a sleeping bag than a blanket. When you compare the weight to warmth, the Tact Bivvy is the best bang for your buck. It provides maximum heat, with minimal weight. Making it the perfect survival blanket for bug out bags, get home bags, survival packs or glove boxes. Not only that, but it is windproof, waterproof, easy to use, and includes a small stuff sack. This helps keep it stored neatly when you are not using it. And the best part? It’s affordable. At this price, it’s an accessible survival tool for everyone. We even tested the Tact Bivvy on a chilly 40-degree overcast day. “Just In Case” Jack (our managing editor) recorded temperatures inside the Tact Bivvy and after only 10 minutes it was a warm 82 degrees. It was so warm inside the Tact Bivvy he got out shortly after 10 minutes to keep from overheating. If it works this well on a cool 40-degree day, it’s a legitimate lifesaver in below zero survival situations. The bottom line is – The Tact Bivvy works and is excellent for cold weather survival. At the time we published this post, Survival Frog was offering a 20% discount plus a box of waterproof matches! Click here to see if this fantastic deal is still available! I recommend you get one for your bug out bag, one for your medical first aid kit, one for your car, and your home. Believe me, when it comes to survival blankets, you can never have too many of them. You can survive for a few days without water and a few weeks without food. But exposed to the elements, without a way to stay warm, you can die in hours (or even minutes). Do not take the risk! Arm yourself with a Tact Bivvy in any and every place you might need one. Here’s “Just in Case” Jack’s video review of the Tact Bivvy. While the Tact Bivvy by Survival Frog is Skilled Survival’s top recommend emergency blanket, there are other options. These highly cost-effective Mylar blankets are designed to retain up to 90% of your body heat inside of them. They are durable, lightweight, and this offer comes with four per order. So if one gets damaged, or want survival blankets for multiple people, Swiss Safe’s got you covered. They also come covered with a 100% satisfaction guarantee. They are also multifunction backcountry tools. You can use them for ground cover, gear cover, and, of course, emergency shelter. The bright orange color provides maximum visibility for rescue teams. Orange is helpful if you’re stranded in the wilderness and in need of rescue. Unlike the other options, this is technically neither a bivvy or a blanket. It’s a tent! It sets up with paracord to hold up the center. It provides shelter (for up to two full sized adults) from the elements keeping you both warm and dry. But remember: this IS NOT a camping tent. It’s an emergency tent/survival blanket and best for emergency situations. Compared to wool, this all-weather emergency blanket is pound for pound warmer. Use it as a ground cover to keep sleeping bags dry, and to add an extra layer of insulation between you and the ground. But it can also be used as a wilderness survival shelter. The material is water resistant, and the corners have grommets. The grommets allow you to turn it into a makeshift shelter in the backcountry. Its heat reflective properties contain up to 80% of a person’s body heat. 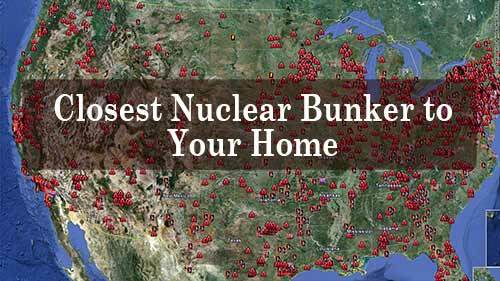 This list would not be complete without a Military-quality wool survival blanket. Yes, it is bulky. Yes, it is heavier than Mylar. But wool is a tried and tested survival material that has saved countless lives over the years. Wool blankets are some of the best when it comes to survival. And they are relatively cheap, too – meaning you can buy one for your car, and another few for your home. That way you have always got a warm wool blanket near at hand. Bonus Tip: Wrap a wool blanket around yourself and a Mylar blanket over that. Machine washable, reusable, waterproof and windproof this “stadium blanket” is an incredible survival tool. It’s made with thick quilted fleece to provide maximum protection from the elements. And it comes with a lifetime warranty. You can replace it no problem if it ever causes you any trouble. As I mentioned before, “down” is one of my favorite materials for survival blankets. Why? Because it generates heat, it is extremely light, and it packs down into almost nothing. This particular model weighs only 1.15 pounds. And it comes with a fitted stuff sack so you can pack it away easily in a backpack, bug out bag, car, desk, or survival kit. Bivy sacks make great lightweight emergency rescue devices. This Escape Bivvy is a good option for all types of survival emergencies. It a good piece of survival gear for a bug out bag list, a get home bag list, or for survival camping. The SOL Escape Bivvy is lightweight, breathable and durable. Here’s a good overview of this S.O.L escape bivvy. Alright, so you’ve bought a mylar blanket and the time has come to use it. But when you’re thrown into an emergency, and it is freaking cold outside – now what? Using an emergency blanket is not as straightforward as most people think – it requires some explanation or directions for proper use. 1. Be CAREFUL when you pull your emergency blanket out. Yes, they’re advertised as “extremely durable.” But Mylar won’t stand up to contact with sharp objects – like a large fixed blade knife. There are instances of emergency blankets tearing when pulled out of its container. So be gentle! Don’t panic, even if you’re cold and afraid. Remove your Mylar blanket from its pouch slowly, and tenderly. If you tear it, you’re in trouble. 2. Mylar does NOT generate heat. Unfortunately, while Mylar is incredible, it doesn’t overcome the law of thermodynamics. It will contain your body heat, and block wind, and help maintain your temperature. But it’s not going to increase your body temperature. We highly recommend that you keep at least two Mylar blankets handy at all times. Think rationally: these blankets are ultra-thin, and weigh next to nothing. If you have two, you can layer them up and double your heat retention capabilities. Or, if you’re with another person when frigid disaster strikes, you’ll have an extra to share. 4. Never pull a Mylar blanket over your head. Tempting as it may be to wrap yourself up entirely like a mummy, face and all, DO NOT DO IT! So when your face is inside, your breath will create condensation on the inside. This condensation will drop your body temperature like a rock. The drier the inside of your Mylar blanket stays, the better off you will be. You’ll also be traping in your exhaled breath or CO2. So over time, you could pass out due to the increased CO2 air mixture build-up trapped in the mylar blanket. 5. The Bigger, the Better. When it comes to Mylar emergency blankets, go big or go home. Some of them sized for children or young adults. If you unknowingly get one of those, you might find it too small to cover you up completely. So pay close attention to the dimensions of the Mylar blankets you decide to invest in. Finally, here’s a video on several survival hacks using a mylar blanket. When people prepare for emergencies, they usually think of survival food and emergency water storage first – which is natural (and practical) preparation. But what many forget is the need to preserve your body heat in an emergency or survival situation. Exposure can kill a person in mere minutes. So without a way to protect yourself, it won’t matter how many dehydrated meals stash, or how much water you’ve stored. You’re fatally vulnerable without an emergency blanket. Luckily, emergency/survival blankets are not only easy to come by but cheap too. There is no good reason NOT to add one to your bug out bag, survival kits, and survival vehicle. I like to think of survival blankets as one of the most affordable, one-time fee insurance policies you can buy. Get a survival blanket today! Thanks for the fascinating article comparing the different options and the various items available. I read a lot of your articles and find them really helpful. I believe that I’ve spotted one problem with the information in this article. ” 2. Mylar does NOT generate heat. Unfortunately, Mylar is not like down or wool in this sense. It will contain your body heat, and block wind, and help maintain your temperature. Whilst this is true in that Mylar does not create any extra heat to increase your body temperature as you say, it simply traps the heat generated by the body. However, the suggestion that wool or down or anything else creates extra heat/increase body temperature in any way is simply wrong, there is no mechanism by which it could do this. These materials also simply trap the heat created by your body as Mylar does. If you ask yourself how would any blanket (wool, down or anything else) obtain energy to turn into extra heat/warmth the inevitable answer is that it can’t. No blanket can generate heat without a source of energy. If it was an electric blanket plugged into a power socket then yes it could create heat. However, a blanket, no matter what it’s made from, can only trap the heat released from the person wrapped in it, slowing its escape just as Mylar does. Mountain Rescue services do, in certain circumstances, use packs of heat generating gel or crystals, (the heat comes from an exothermic chemical reaction). These are similar to the ‘hand warmer’ packs often found in outdoors shops. They are placed inside the layers of insulating blankets or bags that they wrap around a casualty. This is the way extra heat is added to the system and to the casualty. Of course another person’s body heat would help in a similar way. Please don’t take my comment as a criticism of your excellent website and the hard work you clearly put in. Thanks for the kind comment and friendly correction. The article has been adjusted to reflect this.